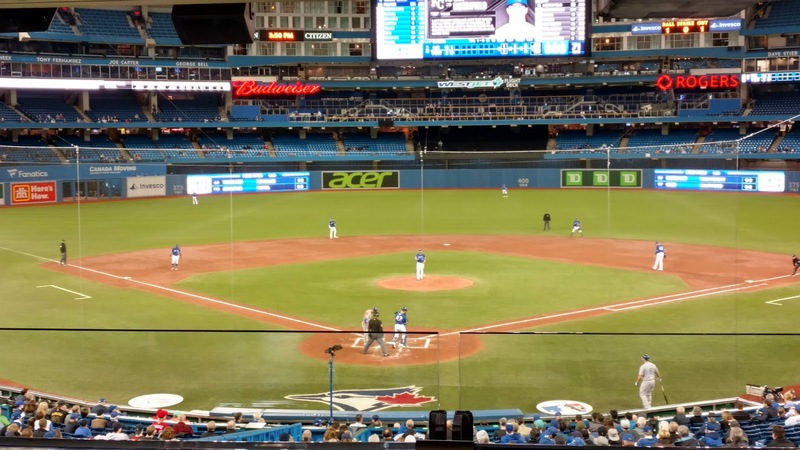 I usually don't write about revisiting sports venues, but there was a special situation in Toronto this past week. I had planned a long weekend trip to visit family in Belleville and see a single AHL game during that time. But the sporting gods had other ideas. First, the Kingston Frontenacs had a second-round playoff game set for Friday, the day of my arrival, so I added that to my schedule. Then Toronto FC defeated Club America in the CONCACAF Champions League semifinals and the first leg of the final was set for Toronto on Tuesday. My original plan was to return to NYC via Syracuse where I could check out a AAA ballgame that evening, but I quickly changed directions and added the soccer game to my itinerary. 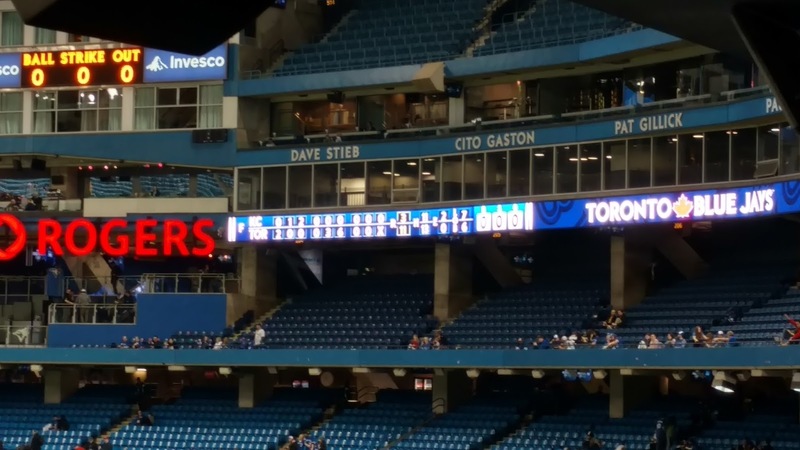 The Blue Jays were also home from Monday, but with Tuesday's game scheduled for the same time as TFC, I didn't expect to be able to see them play. But the ice storm that swept through the province over the weekend ended up being a blessing in disguise. 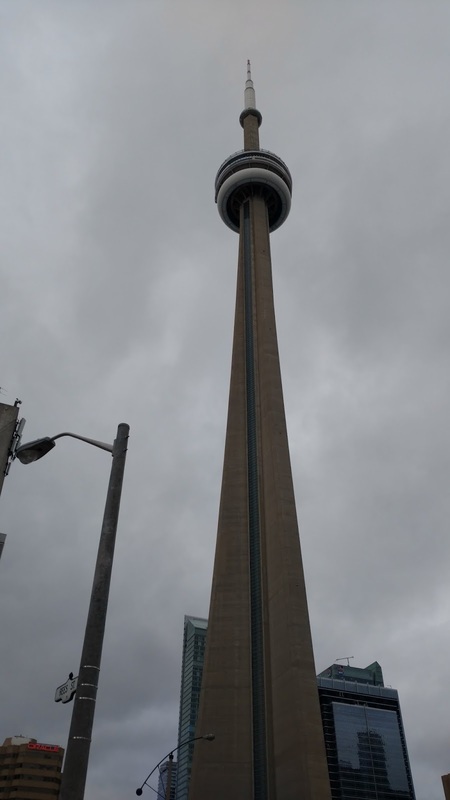 On Monday, ice falling from the CN Tower (above) punctured a hole in the roof of the Rogers Centre, forcing the postponement of that evening's game. 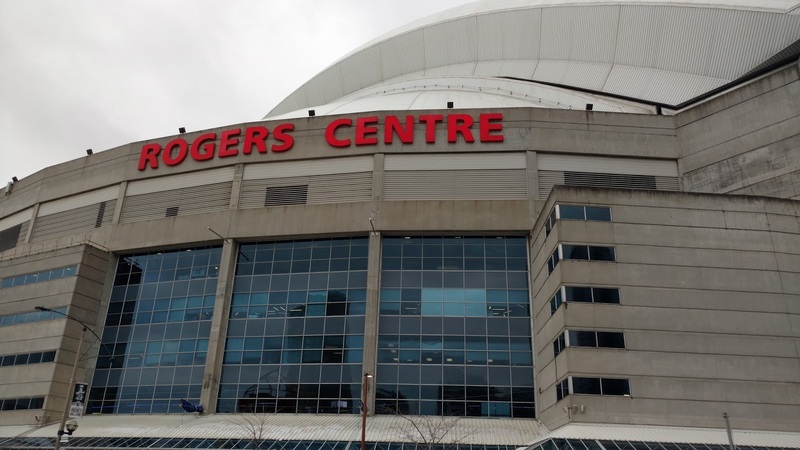 With the visiting Royals making their only stop in Toronto, the powers that be had limited options for the make-up date, and decided to schedule a traditional very rare dome doubleheader on Tuesday with a start time of 3:07. However, with TFC set for an 8:30 kickoff, I would only be able to see the first ballgame and possibly a few innings of the second before moving on to the soccer match. I wish the start time had been a couple of hours earlier so a tripleheader could have been seen, but as Meatloaf said, two out of three ain't bad. I was staying out in Mississauga, so took the GO Train from Clarkson and arrived at Union Station at about 2:40. It's a good thing I did because ice was still falling from the CN Tower and the shortest path to the dome was blocked off, so it took about 25 minutes to walk to the gates along Blue Jays Way. It was amazing to look up and see sheets of ice floating slowly to the ground from a thousand feet up, almost like paper until they shattered upon impact. No doubt serious injury would occur to anyone who was hit by the falling ice, and some pieces landed quite close to us. Scalpers were surprisingly scarce at the ballpark, and with a long line at the ticket window, I resorted to my phone, picking up a mobile ticket for $6. I do prefer hard tickets, but not if it will cost me significantly more than the secondary market or I have to wait, which was the case on this afternoon. This was my first visit since David Price's Blue Jay debut on the Civic Holiday in 2015, so I took a quick walk around to refresh my memory. The designated driver booth is hidden behind section 104 in the outfield, but as you get a 24-oz drink when you sign up, it is worth the walk. You can also stand on the concourse along the baselines along the 100 level, which I did for a few innings. While there, I overheard a supervisor ask an usher to collect a couple of younger guys who had snuck in to the good seats. The pair was escorted back up the stairs, and sheepishly stood by as the supervisor reprimanded them. He did not send them back into the cold, as was his right, but into the upper deck where their seats were. I've seen people kicked out of the good seats before, but never lectured for their daring. With that in mind, I headed to my upper deck seat for the middle innings. 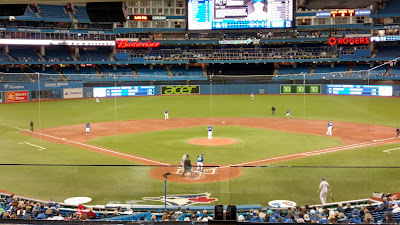 That seemed to be my lucky seat as the Jays scored 3 in the 5th and another 6 in the 6th to pummel the Royals 11-3. 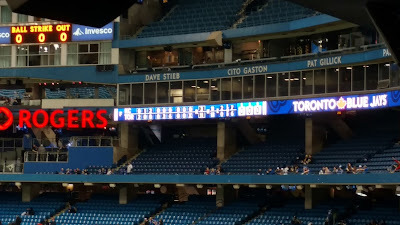 The second game started at 6:37 and I hung around for the first inning, but decided to head out with the Jays down 1-0 as I needed to grab dinner before moving on to BMO Field. The Jays ended up sweeping the doubleheader with a 5-4 victory in 10 innings. TFC, on the other hand, well, you can read about that in the next post. I still think teams in the same city should cross-promote (discounts if you show a ticket from another game on the same day, for example) and schedules should be made so that there are as few conflicts as possible. In New York, MLB has already sent both the Yankees and Mets on the road at the same time for two series, and scheduled both teams for a Wednesday afternoon game at home. In Philadelphia, Game 6 of the Flyers first-round series was set for 3:00 on Sunday despite the Phillies playing across the road at the same time. In both cases, season-ticket holders were inconvenienced. I realize TV ratings are all that matters, but how about a thought for the fans who actually invest their time and money by attending the games?